I am irritable around crowds. I succumb to a sweat very easily. I emit a pungent stink when I feel threatened, confused, or bored. I hate people. I am unreasonably nervous around unfamiliar situations. I’m afraid of open spaces, closed spaces, and all spaces in between. Tall ceilings make me suspicious. I am bashful. Masses of strangers make me seek the exits and flee screaming towards the nearest authority figure so I can scramble on top of their shoulders and swing wildly at the nearest passerby. And what’s worse is at least three of these things are true. 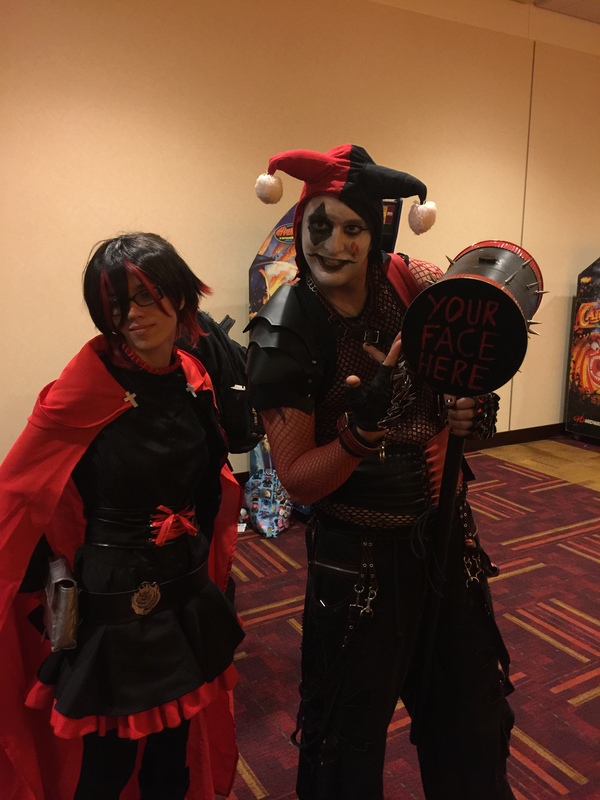 So I went to GenCon, the world’s largest gaming convention. Like everything else in life and death, it starts with a line. In this case, the line to pick up the lanyard that holds the four-day pass for those of us who had the foresight to order early. It turns out a lot of people have foresight. What you are looking at is the last fifth of the line. The “Will Call” booth opened at noon on Wednesday, August 3rd. At 11:50 AM, the line snaked around the convention center and out the door. This is the last fifth of the line. So I did my time, waited, and my patience paid off! I got my lanyard! And then promptly skipped the first day. When I discovered I left my lanyard at home. 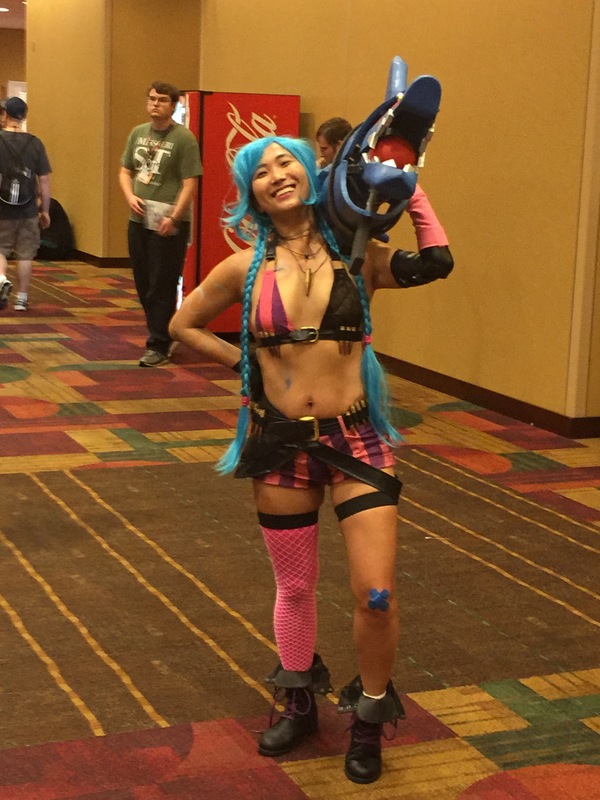 GenCon: Day Two One, Take One Two! 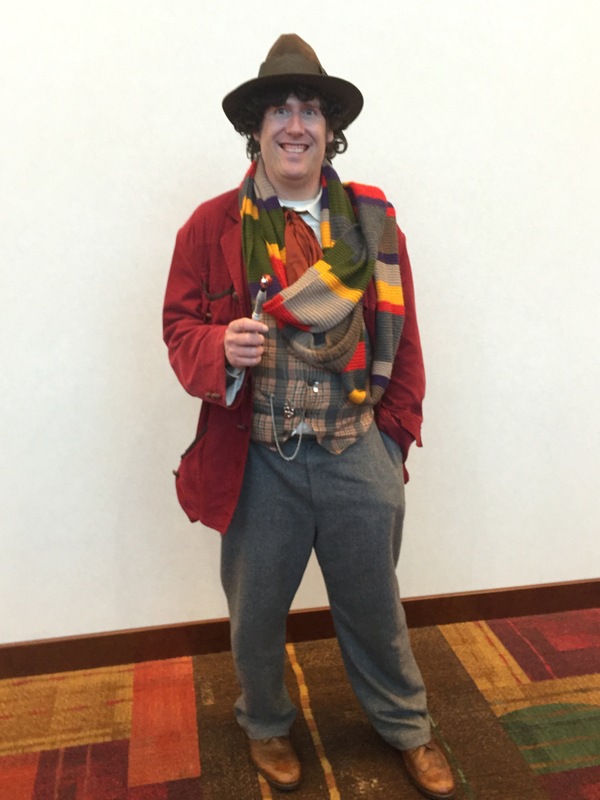 After a couple hours of retrenching and several creative uses of the shadier side of language, I got called another Uber, made sure I had a death grip on the lanyard and went to GenCon. This was ONE gaming hall. One of many scattered around the convention center and the surrounding buildings. I walked in with no plan, no direction, and no idea where anything was. I was absolutely over my head. I was playing GenCon on Hard Mode. So I did what most would do: I gravitated towards the large robot. Now as far as large robots go, this was not very large. It also wasn’t a robot. It was a statue. More to the point it was a representation of a large robot that doesn’t actually exist. Well, it exists, but this is apparently a miniature version of something that doesn’t exist. So the statue of a robot that doesn’t exist is a miniature, yet at the same time actual size. Believe it or not, paradoxes like this calm me down. I wonder if people come here to feel normal. This woman was absolutely delightful. No snark there. I don’t have to seek out that obscure grammatical symbol indicating sarcasm. She was legitimately pleasant. Anyway, this lady came to GenCon, sat down, and played while smiling the whole time. Who is she in real life? What does she do? I am guessing she doesn’t sit in the Indy Convention Center playing a mysterious wooden instrument with a crank as her full-time job. And I don’t think that is professional dress, unless she is a butter churner that escaped Knott’s Berry Farm and made it to the wooly wilds of Indiana. She has to be doing SOMETHING else for the rest of the year, right? It doesn’t matter. She was absolutely in the moment, sitting in the middle of a dense crowd stamping hither and thither, and grinning like a sleeping cat. Regardless of her “real life” situation, during the moments she was dressed in an old-tyme milkmaid costume and cranking something that for all I know had a direct link to the hoary underworld where the screams of the damned call for vengeance and cool refreshments (it could happen), she had it all figured out. Incidentally, in case you were wondering, I have no idea what that instrument is. If you know, don’t tell me. I think there should be a little mystery in life. … all of whom were for all appearances having the time of their lives. They were at the very least gracious and pleased to have their picture taken. Perhaps it’s because of the swords. These pictures aren’t a very good representation of the mainstay of costuming, most of which involved swords. I can’t imagine they were real swords. Cosplaying is all fun and games until somebody loses an eye. Then they have to dress as a pirate. Speaking of disasters, I want to address a certain group of cosplayers: people who love Steampunk. Yes, you, Abraham Lincoln guy wearing a grafted on Gatling gun and NOT a series of mailing tubes, painted duct tape, a beer bottle, and half of a FRAM CA3187 air filter. I know that life is cruel. I know that people hanker for a specific time in the past; namely, a time that has never and could never exist. I know that when it came out it was trendy and cutting edge. I know that… well, I don’t know much more than that. Anyway, that time has passed. I say this because I love you. Because WE love you. Anywhoozle, you are very dear to us and we hate to see you reach out to something that is not good for you. Come back and dress like an obscure anime character like the rest of us. Hearts & kisses! Sorry, everyone. Just planting seeds*. This is not to say that everyone else’s costume was a work of art, or even fussed over for any period of time. A lot of people half-assed their costumes. However, I am in no position to judge. Their costumes are not nearly as half-assed as mine. What’s my costume? Rapidly aging adolescent. 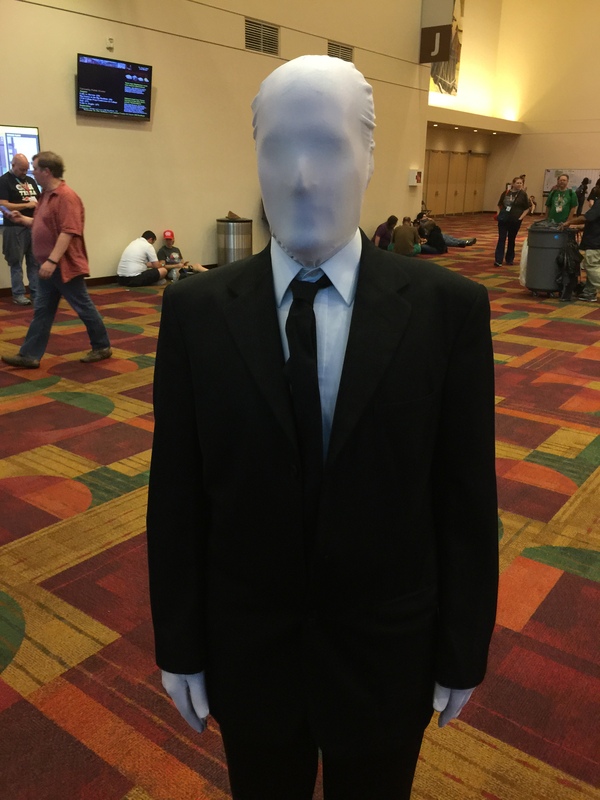 In the end, I cannot mock people for cosplay. I mock myself for not being clever enough to do it. I had never seen so many backs in my life. I’ve been to baseball games, football games, and even the 4th of July at the Mall in Washington D.C. (Note: DON’T DO THAT.) But this seemed a little more intense. Probably because it was crowded shoulder-to-shoulder within an enclosed area. Walking through the crowds gave me a new appreciation of what being a red blood cell in the bloodstream is like. I was buffeted along a vast stream of geeks, flowing down every possible corridor. Most of the time I could direct where I was going with great difficulty, but the real success in getting from A to B is succumbing to the flow of the crowd. To do anything else, to fight against the crowds, would be to render myself insensible, ridiculous, and awkward, like a duck with a concussion. For most of the first (second?) day, I didn’t know where I was, had no idea what I was doing, had never heard of 99.9% of the games displayed,**and could not imagine myself playing them anyway. If I were to join a game, my focus would be to lose as quickly as possible so I could get the experience behind me. All in all, it was very cool. But this is more than mere child labor. This photo was taken at about 10:30 PM on a Friday night. If you look at the expression on these kids’ faces, you get the idea of how long they’ve been at work. They were building a cityscape. A cityscape made out of game cards. Look upon their works, ye mighty, and despair! They had only just begun this process. They had the whole weekend to toil during the largest gaming convention in the world. This picture was taken on day two of a project that had lasted for days and would extend into the late hours. Long past the time when kids should be in bed, these children were working past exhaustion into a zen-like trance, a glimpse of the nirvana one gets when slaving away long past the sane point of stopping. They were creating an intricate, delicate, and beautiful series of spires and buildings for charity. So the highest bidder can destroy it. For the right amount of money, you too can become “Death, Destroyer of Worlds!” IT’S THE AMERICAN WAY! Keep in mind, this is a convention filled with the kind of people who, like me, would sit in a corner and pet the cat at a party. But if you are the top donor to the charity (The Pourhouse), then you can utterly destroy the detailed work of exhausted child laborers! It’s like blowing up a Nike factory! So I found the gooey fun at the center of the hard day of wandering around GenCon without a clue about what to do. There are so many places to see there that, in the end, you either have to make your own fun or watch someone else make theirs. It is overwhelming. Then one comes across an anchor like the eventual annihilation of the careful and loving work of children. I lost myself for a little bit in the wonder of it. It is something I had not thought of before. GenCon is filled with those kinds of things. It’s an exhausting slog around a massive complex, with crowds flowing in impenetrable streams or nerds branching towards unknown destinations. But people stayed happy despite the exhaustion and the absurd difficulty in getting from here to there. It takes guts to remain happy and weird in the face of adversity. Even more in the face of absurdity. By the time 11:00 PM rolled around, my phone battery had 5% left. My mind, less so. It was time to ride home, sleep, and see what else I could find the next day. NOTE! Many thanks to Katrina Schwartz for taking me by the hand, leading me to her friends, and teaching me how to relax and love GenCon despite its size, smell, and intense density! And many other thanks to Tam Black for arranging it. Katrina, you and your friends are the REAL heroes! * NOTE: for those of you who don’t know, Steampunk is costuming for people who don’t have a lot of time but DO have access to their grandmother’s closet. It was inspired by the writings of Jules Verne and H.G. Welles, as well as the assumption that people in the past were wildly impractical. The look involves a lot of copper and brass for some reason. Guys and Gals, steel was a thing back then. You really shouldn’t make a Gatling gun out of copper. No, not even brass. ** An actual, verifiable number and not at all an exaggeration for literary purposes.